Download "Site Recovery Manager Installation and Configuration"
2 Site Recovery Manager Installation and Configuration You can find the most up-to-date technical documentation on the VMware Web site at: The VMware Web site also provides the latest product updates. 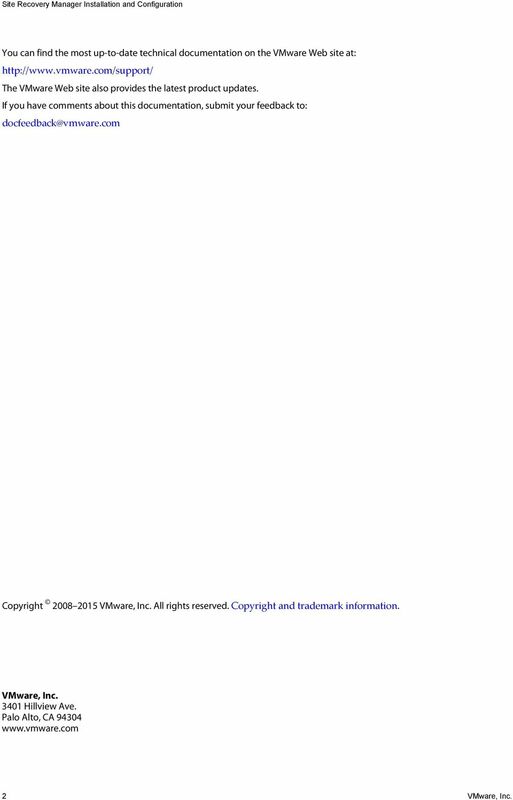 If you have comments about this documentation, submit your feedback to: Copyright VMware, Inc. All rights reserved. Copyright and trademark information. VMware, Inc Hillview Ave. Palo Alto, CA VMware, Inc.
4 Site Recovery Manager Installation and Configuration 7 Configuring Array-Based Protection 61 Install Storage Replication Adapters 61 Configure Array Managers 62 Rescan Arrays to Detect Configuration Changes 63 Edit Array Managers 64 8 Installing vsphere Replication 65 Deploy the vsphere Replication Virtual Appliance 66 Configure vsphere Replication Connections 67 Reconfigure the vsphere Replication Appliance 68 Deploy an Additional vsphere Replication Server 79 Register an Additional vsphere Replication Server 80 Reconfigure vsphere Replication Server Settings 80 Unregister and Remove a vsphere Replication Server 81 Uninstall vsphere Replication 82 Unregister vsphere Replication from vcenter Server if the Appliance Was Deleted 82 9 Upgrading vsphere Replication 85 Upgrade vsphere Replication by Using the Downloadable ISO Image 87 Update vcenter Server IP Address in vsphere Replication Management Server 87 Update vsphere Replication By Using vsphere Update Manager 88 Update vsphere Replication by Using the VAMI Creating Site Recovery Manager Placeholders and Mappings 93 About Placeholder Virtual Machines 93 About Inventory Mappings 94 About Placeholder Datastores 96 Configure Datastore Mappings for vsphere Replication Installing Site Recovery Manager to Use with a Shared Recovery Site 99 Limitations of Using Site Recovery Manager in Shared Recovery Site Configuration 102 Site Recovery Manager Licenses in a Shared Recovery Site Configuration 103 Install Site Recovery Manager In a Shared Recovery Site Configuration 104 Use Array-Based Replication in a Shared Recovery Site Configuration 110 Use vsphere Replication in a Shared Recovery Site Configuration 110 Upgrade Site Recovery Manager in a Shared Recovery Site Configuration Troubleshooting Site Recovery Manager Installation and Configuration 113 Cannot Restore SQL Database to a 32-Bit Target Virtual Machine During Site Recovery Manager Upgrade 114 Site Recovery Manager Server Does Not Start 115 vsphere Client Cannot Connect to Site Recovery Manager 116 Site Pairing Fails Because of Different Certificate Trust Methods 117 Error at vservice Bindings When Deploying the vsphere Replication Appliance 118 OVF Package is Invalid and Cannot be Deployed 118 vsphere Replication Appliance or vsphere Replication Server Does Not Deploy from the Site Recovery Manager Interface 118 vsphere Replication Cannot Establish a Connection to the Hosts VMware, Inc.
6 Site Recovery Manager Installation and Configuration 6 VMware, Inc.
8 Site Recovery Manager Installation and Configuration 8 VMware, Inc.
10 Site Recovery Manager Installation and Configuration Revision Description EN Clarified supported upgrade paths in Chapter 6, Upgrading Site Recovery Manager, on page 47. 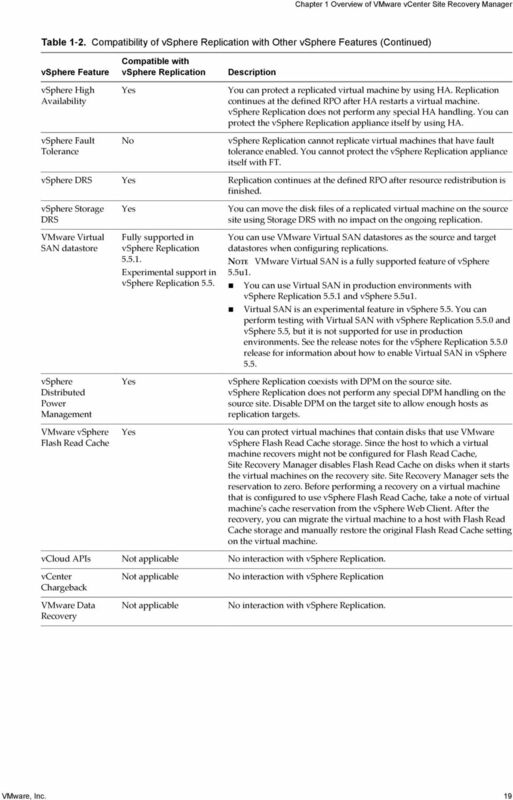 EN Added statement of full support for VMware Virtual SAN in vsphere 5.5u1 and vsphere Replication Added Bandwidth Requirements for vsphere Replication, on page 25. 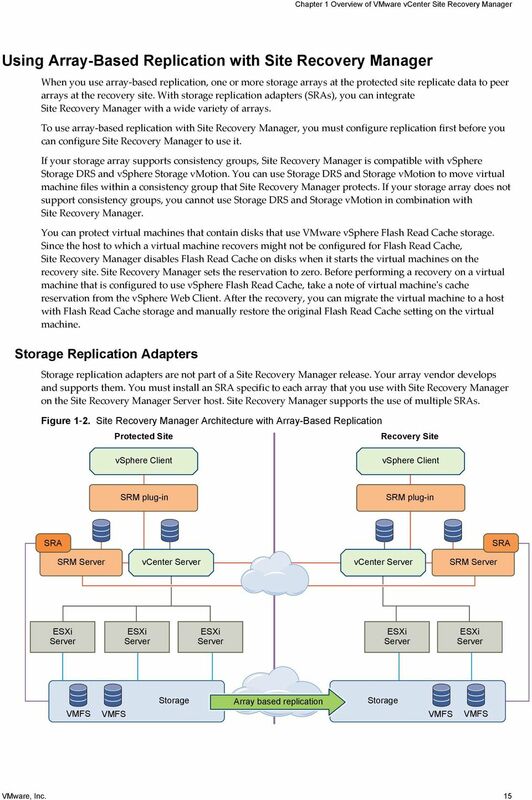 Clarified how Site Recovery Manager interacts with vsphere Flash Read Cache in Using Array- Based Replication with Site Recovery Manager, on page 15 and Compatibility of vsphere Replication with Other vsphere Features, on page 18. 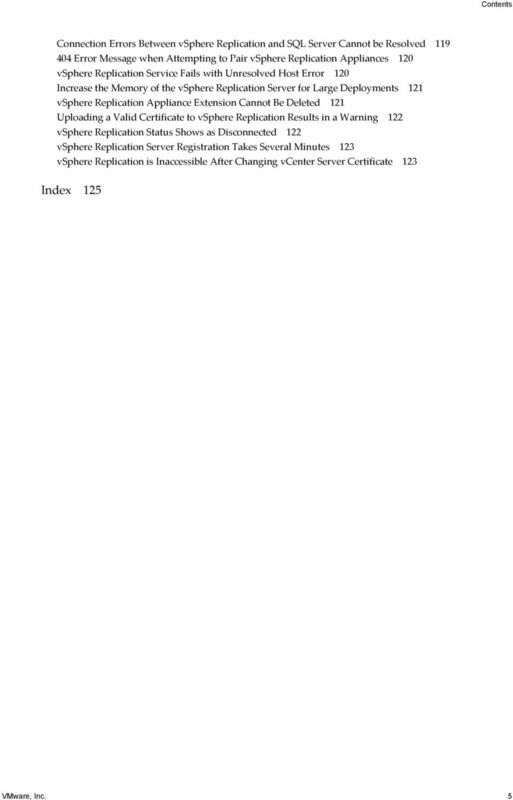 Expanded the information about the use of SQL authentication and Windows authentication in Requirements when Using Microsoft SQL Server with Site Recovery Manager, on page 30 and Create an ODBC System DSN for Site Recovery Manager, on page 31. Clarified that the Site Recovery Manager administrator address is not used by Site Recovery Manager Server in Install the Site Recovery Manager Server, on page 38 and Modify the Installation of Site Recovery Manager Server, on page 43. Clarified that you upgrade vsphere Replication to 5.5 by using the downloadable ISO image and you install 5.5.x update releases by using the VAMI or vsphere Update Manager in Chapter 9, Upgrading vsphere Replication, on page 85. 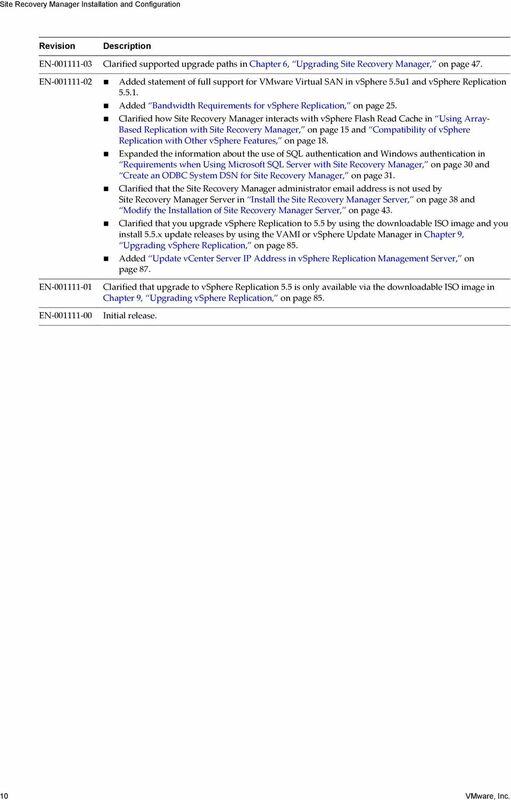 Added Update vcenter Server IP Address in vsphere Replication Management Server, on page 87. EN EN Clarified that upgrade to vsphere Replication 5.5 is only available via the downloadable ISO image in Chapter 9, Upgrading vsphere Replication, on page 85. Initial release. 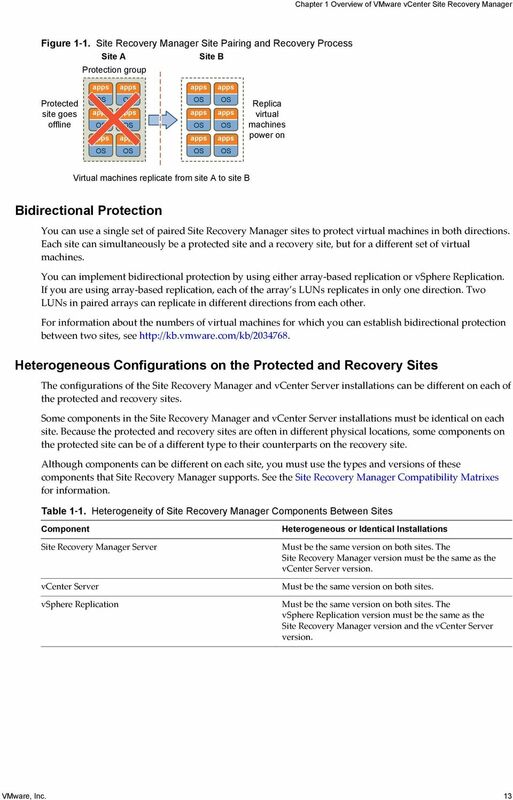 10 VMware, Inc.
12 Site Recovery Manager Installation and Configuration Using Array-Based Replication with Site Recovery Manager on page 15 When you use array-based replication, one or more storage arrays at the protected site replicate data to peer arrays at the recovery site. With storage replication adapters (SRAs), you can integrate Site Recovery Manager with a wide variety of arrays. Using vsphere Replication with Site Recovery Manager on page 16 Site Recovery Manager can use vsphere Replication to replicate data to servers at the recovery site. 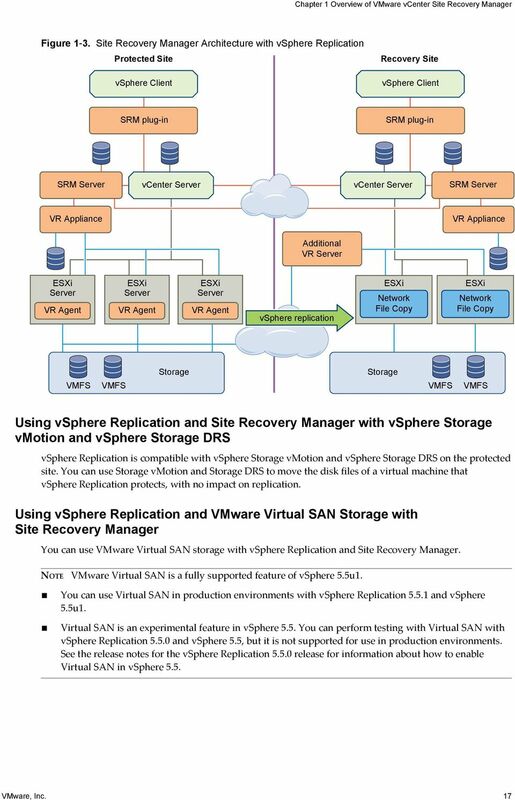 Using Array-Based Replication and vsphere Replication with Site Recovery Manager on page 20 You can use a combination of array-based replication and vsphere Replication in your Site Recovery Manager deployment. 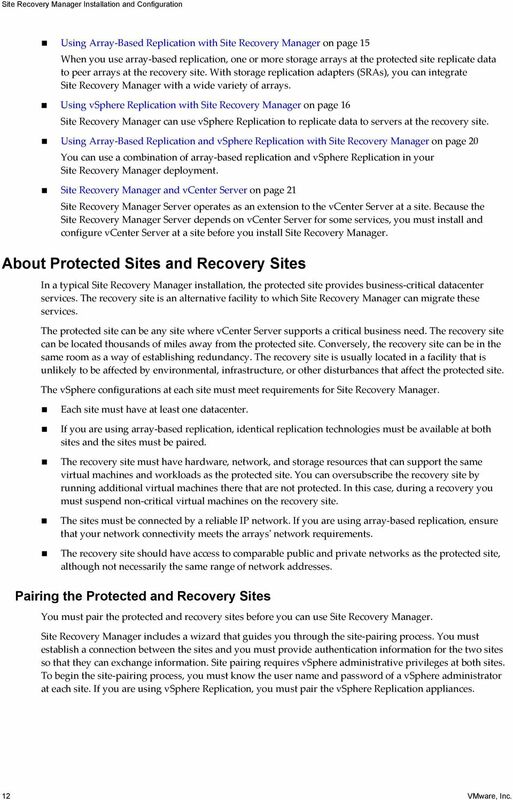 Site Recovery Manager and vcenter Server on page 21 Site Recovery Manager Server operates as an extension to the vcenter Server at a site. Because the Site Recovery Manager Server depends on vcenter Server for some services, you must install and configure vcenter Server at a site before you install Site Recovery Manager. About Protected Sites and Recovery Sites In a typical Site Recovery Manager installation, the protected site provides business-critical datacenter services. The recovery site is an alternative facility to which Site Recovery Manager can migrate these services. The protected site can be any site where vcenter Server supports a critical business need. The recovery site can be located thousands of miles away from the protected site. Conversely, the recovery site can be in the same room as a way of establishing redundancy. The recovery site is usually located in a facility that is unlikely to be affected by environmental, infrastructure, or other disturbances that affect the protected site. The vsphere configurations at each site must meet requirements for Site Recovery Manager. Each site must have at least one datacenter. If you are using array-based replication, identical replication technologies must be available at both sites and the sites must be paired. The recovery site must have hardware, network, and storage resources that can support the same virtual machines and workloads as the protected site. You can oversubscribe the recovery site by running additional virtual machines there that are not protected. In this case, during a recovery you must suspend non-critical virtual machines on the recovery site. The sites must be connected by a reliable IP network. If you are using array-based replication, ensure that your network connectivity meets the arrays' network requirements. The recovery site should have access to comparable public and private networks as the protected site, although not necessarily the same range of network addresses. Pairing the Protected and Recovery Sites You must pair the protected and recovery sites before you can use Site Recovery Manager. Site Recovery Manager includes a wizard that guides you through the site-pairing process. You must establish a connection between the sites and you must provide authentication information for the two sites so that they can exchange information. Site pairing requires vsphere administrative privileges at both sites. To begin the site-pairing process, you must know the user name and password of a vsphere administrator at each site. If you are using vsphere Replication, you must pair the vsphere Replication appliances. 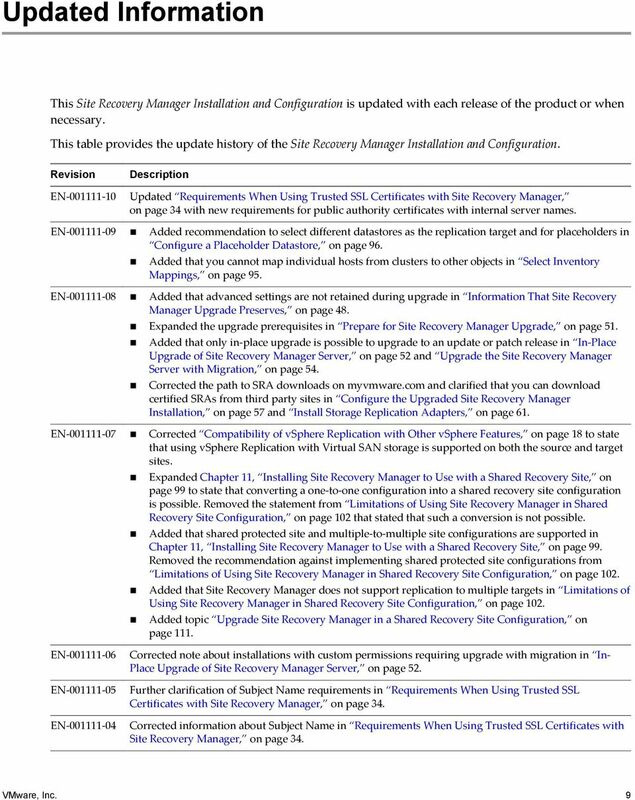 12 VMware, Inc.
14 Site Recovery Manager Installation and Configuration Table 1 1. 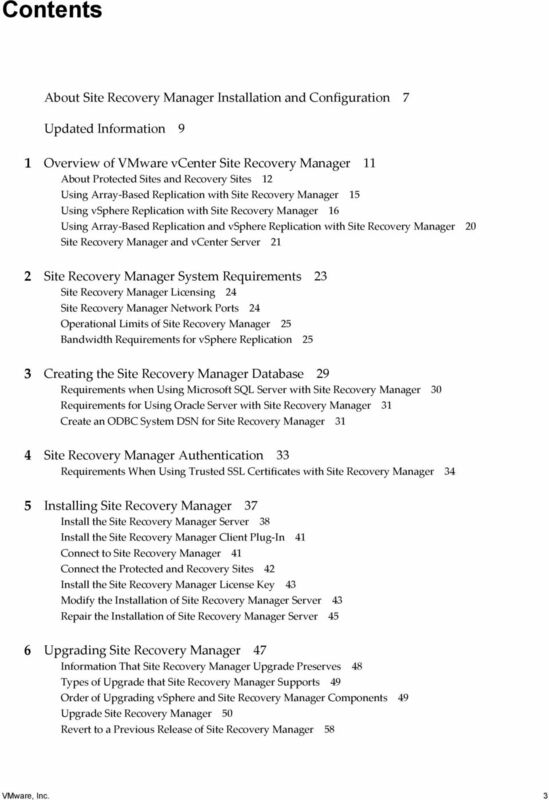 Heterogeneity of Site Recovery Manager Components Between Sites (Continued) Component Authentication method vcenter Server Appliance or standard vcenter Server instance Storage arrays for array-based replication Site Recovery Manager database Host operating system of the Site Recovery Manager Server installation Host operating system of the vcenter Server installation Heterogeneous or Identical Installations Must be the same on both sites. If you use autogenerated certificates to authenticate between the Site Recovery Manager Server instances on each site, you must use autogenerated certificates on both sites. If you use custom certificates that are signed by a certificate authentication service, you must use such certificates on both sites. Similarly, the authentication method that you use between Site Recovery Manager Server and vcenter Server must be the same on both sites. If you use different authentication methods on each site, site pairing fails. Can be different on each site. You can run a vcenter Server Appliance on one site and a standard vcenter Server instance on the other site. Can be different on each site. You can use different versions of the same type of storage array on each site, or different types of storage array. The Site Recovery Manager Server instance on each site requires the appropriate storage replication adapter (SRA) for each type or version of storage array for that site. Check SRA compatibility with all versions of storage array to ensure compatibility. Can be different on each site. You can use different versions of the same type of database on each site, or different types of database on each site. Can be different on each site. You can run different versions of the host operating system and the host operating system can run in different locales on each site. Can be different on each site. You can run different versions of the host operating system and the host operating system can run in different locales on each site. 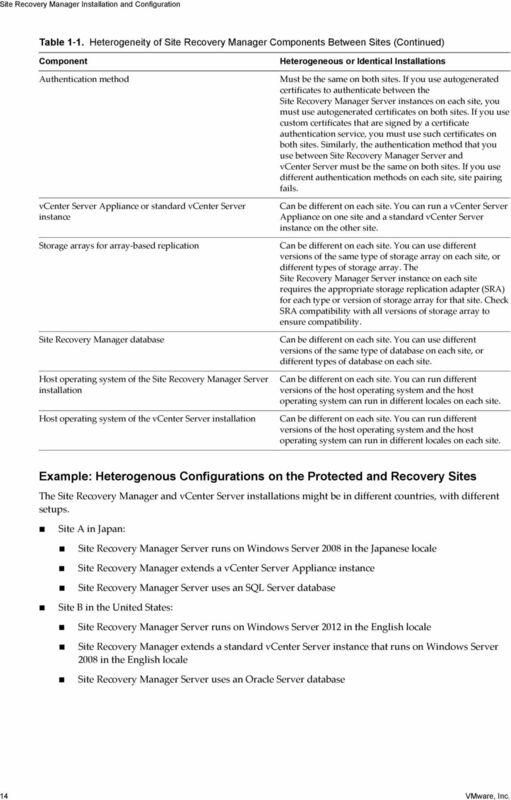 Example: Heterogenous Configurations on the Protected and Recovery Sites The Site Recovery Manager and vcenter Server installations might be in different countries, with different setups. Site A in Japan: Site Recovery Manager Server runs on Windows Server 2008 in the Japanese locale Site Recovery Manager extends a vcenter Server Appliance instance Site Recovery Manager Server uses an SQL Server database Site B in the United States: Site Recovery Manager Server runs on Windows Server 2012 in the English locale Site Recovery Manager extends a standard vcenter Server instance that runs on Windows Server 2008 in the English locale Site Recovery Manager Server uses an Oracle Server database 14 VMware, Inc.
16 Site Recovery Manager Installation and Configuration Using vsphere Replication with Site Recovery Manager Site Recovery Manager can use vsphere Replication to replicate data to servers at the recovery site. You deploy vsphere Replication as a virtual appliance. 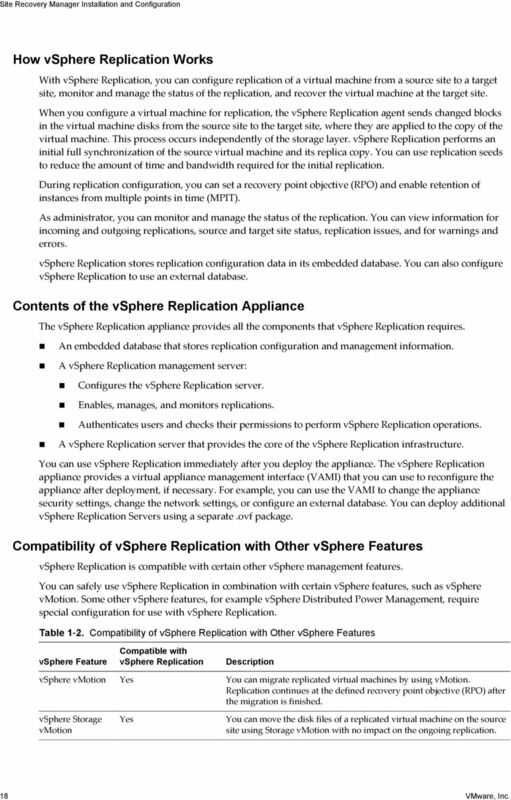 The vsphere Replication appliance contains two components. A vsphere Replication management server: Configures the vsphere Replication server on the recovery site. Enables replication from the protected site. Authenticates users and checks their permissions to perform vsphere Replication operations. Manages and monitors the replication infrastructure. A vsphere Replication server: Listens for virtual machine updates from the vsphere Replication host agent on the protected site. Applies the updates to the virtual disks on the recovery site. If necessary, you can deploy multiple vsphere Replication servers on a site to balance the replication load across your virtual infrastructure. For information about the loads that a vsphere Replication management server and a vsphere Replication server can support, see vsphere Replication does not require storage arrays. The vsphere Replication storage replication source and target can be any storage device, including, but not limited to, storage arrays. You can configure vsphere Replication to regularly create and retain snapshots of protected virtual machines on the recovery site. Taking multiple point-in-time (PIT) snapshots of virtual machines allows you to retain more than one replica of a virtual machine on the recovery site. Each snapshot reflects the state of the virtual machine at a certain point in time. You can select which snapshot to recover when you use vsphere Replication to perform a recovery. 16 VMware, Inc.
18 Site Recovery Manager Installation and Configuration How vsphere Replication Works With vsphere Replication, you can configure replication of a virtual machine from a source site to a target site, monitor and manage the status of the replication, and recover the virtual machine at the target site. When you configure a virtual machine for replication, the vsphere Replication agent sends changed blocks in the virtual machine disks from the source site to the target site, where they are applied to the copy of the virtual machine. This process occurs independently of the storage layer. vsphere Replication performs an initial full synchronization of the source virtual machine and its replica copy. You can use replication seeds to reduce the amount of time and bandwidth required for the initial replication. During replication configuration, you can set a recovery point objective (RPO) and enable retention of instances from multiple points in time (MPIT). As administrator, you can monitor and manage the status of the replication. You can view information for incoming and outgoing replications, source and target site status, replication issues, and for warnings and errors. vsphere Replication stores replication configuration data in its embedded database. You can also configure vsphere Replication to use an external database. Contents of the vsphere Replication Appliance The vsphere Replication appliance provides all the components that vsphere Replication requires. An embedded database that stores replication configuration and management information. A vsphere Replication management server: Configures the vsphere Replication server. Enables, manages, and monitors replications. Authenticates users and checks their permissions to perform vsphere Replication operations. A vsphere Replication server that provides the core of the vsphere Replication infrastructure. You can use vsphere Replication immediately after you deploy the appliance. The vsphere Replication appliance provides a virtual appliance management interface (VAMI) that you can use to reconfigure the appliance after deployment, if necessary. For example, you can use the VAMI to change the appliance security settings, change the network settings, or configure an external database. You can deploy additional vsphere Replication Servers using a separate.ovf package. Compatibility of vsphere Replication with Other vsphere Features vsphere Replication is compatible with certain other vsphere management features. You can safely use vsphere Replication in combination with certain vsphere features, such as vsphere vmotion. Some other vsphere features, for example vsphere Distributed Power Management, require special configuration for use with vsphere Replication. Table 1 2. Compatibility of vsphere Replication with Other vsphere Features vsphere Feature Compatible with vsphere Replication Description vsphere vmotion Yes You can migrate replicated virtual machines by using vmotion. Replication continues at the defined recovery point objective (RPO) after the migration is finished. vsphere Storage vmotion Yes You can move the disk files of a replicated virtual machine on the source site using Storage vmotion with no impact on the ongoing replication. 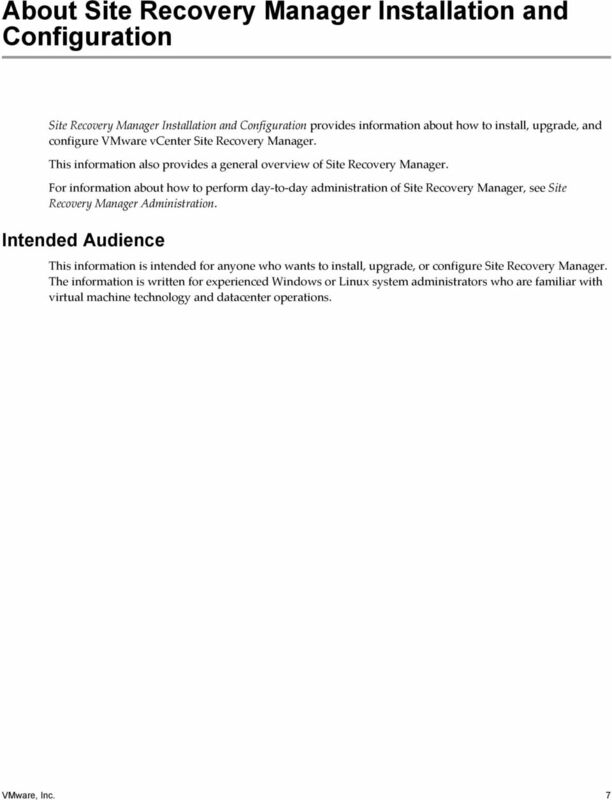 18 VMware, Inc.
20 Site Recovery Manager Installation and Configuration Using Array-Based Replication and vsphere Replication with Site Recovery Manager You can use a combination of array-based replication and vsphere Replication in your Site Recovery Manager deployment. To create a mixed Site Recovery Manager deployment that uses array-based replication and vsphere Replication, you must configure the protected and recovery sites for both types of replication. Set up and connect the storage arrays and install the appropriate storage replication adapters (SRA) on both sites. Deploy vsphere Replication appliances on both sites and configure the connection between the appliances. 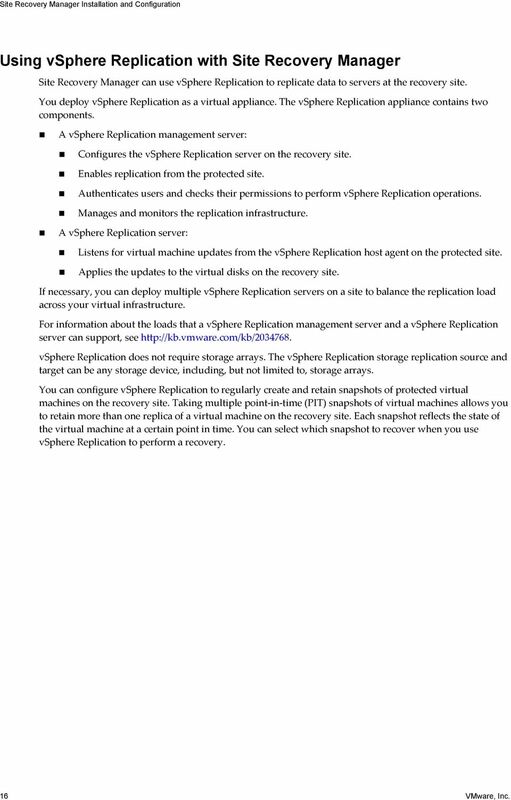 Configure virtual machines for replication using either array-based replication or vsphere Replication, as appropriate. NOTE Do not attempt to configure vsphere Replication on a virtual machine that resides on a datastore that you replicate by using array-based replication. You create array-based protection groups for virtual machines that you configure with array-based replication, and vsphere Replication protection groups for virtual machines that you configure with vsphere Replication. You cannot mix replication types in a protection group. You can mix array-based protection groups and vsphere Replication protection groups in the same recovery plan. Figure 1 4. Site Recovery Manager Architecture with Array-Based Replication and vsphere Replication Protected Site Recovery Site vsphere Client vsphere Client SRM plug-in SRM plug-in SRA SRA SRM Server vcenter Server vcenter Server SRM Server VR Appliance VR Appliance Additional VR Server ESXi Server VR Agent ESXi Server VR Agent ESXi Server VR Agent vsphere replication ESXi Network File Copy ESXi Network File Copy VMFS VMFS Storage Array based replication Storage VMFS VMFS 20 VMware, Inc.
22 Site Recovery Manager Installation and Configuration 22 VMware, Inc.
24 Site Recovery Manager Installation and Configuration Site Recovery Manager Licensing After you install Site Recovery Manager, it remains in evaluation mode until you install a Site Recovery Manager license key. After the evaluation license expires, existing protection groups remain protected and you can recover them, but you cannot create new protection groups or add virtual machines to an existing protection group until you obtain and assign a valid Site Recovery Manager license key. Obtain and assign Site Recovery Manager license keys as soon as possible after installing Site Recovery Manager. Site Recovery Manager licenses allow you to protect a set number of virtual machines. To obtain Site Recovery Manager license keys, go to the Site Recovery Manager Product Licensing Center at or contact your VMware sales representative. Site Recovery Manager License Keys and vcenter Server Instances in Linked Mode If your vcenter Server instances are connected with vcenter Server instances in linked mode, you install the same Site Recovery Manager license on both vcenter Server instances. Site Recovery Manager License Keys and Protected and Recovery Sites Site Recovery Manager requires a license key on any site on which you protect virtual machines. Install a Site Recovery Manager license key at the protected site to enable protection in one direction from the protected site to the recovery site. Install the same Site Recovery Manager license keys at both sites to enable bidirectional protection, including reprotect. Site Recovery Manager checks for a valid license whenever you add a virtual machine to or remove a virtual machine from a protection group. If licenses are not in compliance, vsphere triggers a licensing alarm and Site Recovery Manager prevents you from protecting further virtual machines. Configure alerts for triggered licensing events so that licensing administrators receive a notification by . 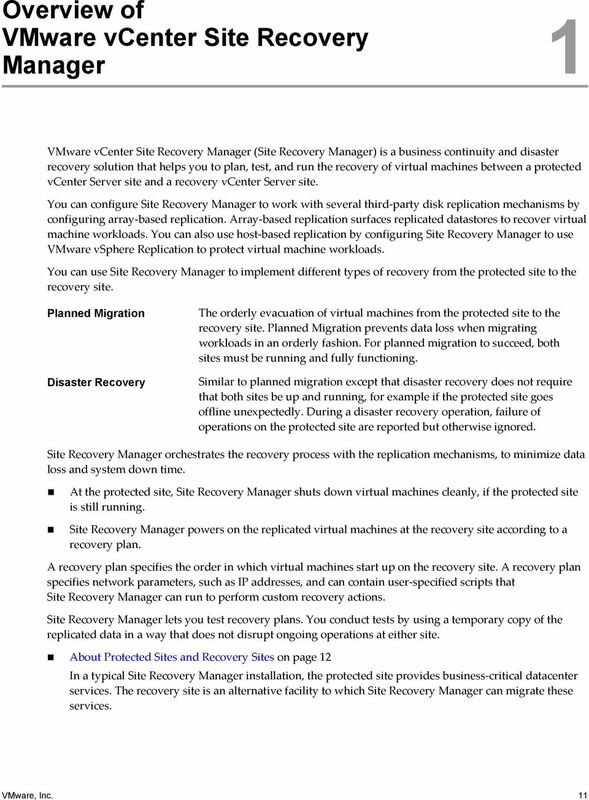 Example: Site Recovery Manager Licenses Required for Recovery and Reprotect You have a site that contains 25 virtual machines for Site Recovery Manager to protect. For recovery, you require a license for at least 25 virtual machines, that you install on the protected site to allow one-way protection from the protected site to the recovery site. For reprotect, you require a license for at least 25 virtual machines, that you install on both the protected and the recovery site to allow bidirectional protection between the sites. Site Recovery Manager Network Ports Site Recovery Manager Server instances use several network ports to communicate with each other, with client plug-ins, and with vcenter Server. If any of these ports are in use by other applications or are blocked on your network, you must reconfigure Site Recovery Manager to use different ports. Site Recovery Manager uses default network ports for intrasite communication between hosts at a single site and intersite communication between hosts at the protected and recovery sites. You can change these defaults when you install Site Recovery Manager. Beyond these standard ports, you must also meet network requirements of your particular array-based replication provider. 24 VMware, Inc.
26 Site Recovery Manager Installation and Configuration Data Change Rate and Recovery Point Objective The data change rate is affected by the recovery point objective (RPO). To estimate the size of the data transfer for each replication, you must evaluate how many blocks change in a given RPO for a virtual machine. The data change rate within the RPO period provides the total number of blocks that vsphere Replication transfers. 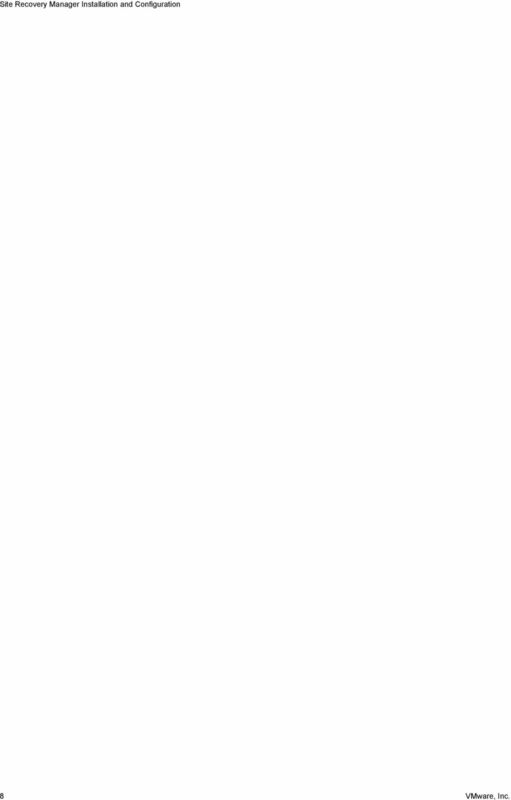 This number might vary throughout the day, which alters the traffic that vsphere Replication generates at different times. vsphere Replication transfers blocks based on the RPO schedule. If you set an RPO of one hour, vsphere Replication transfers any block that has changed in that hour to meet that RPO. vsphere Replication only transfers the block once in its current state at the moment that vsphere Replication creates the bundle of blocks for transfer. vsphere Replication only registers that the block has changed within the RPO period, not how many times it changed. The average daily data change rate provides an estimation of how much data vsphere Replication transfers or how often the transfers occur. If you use volume shadow copy service (VSS) to quiesce the virtual machine, replication traffic cannot be spread out in small sets of bundles throughout the RPO period. Instead, vsphere Replication transfers all the changed blocks as one set when the virtual machine is idle. Without VSS, vsphere Replication can transfer smaller bundles of changed blocks on an ongoing basis as the blocks change, spreading the traffic throughout the RPO period. The traffic changes if you use VSS and vsphere Replication handles the replication schedule differently, leading to varying traffic patterns. If you change the RPO, vsphere Replication transfers more or less data per replication to meet the new RPO. Link Speed If you have to transfer an average replication bundle of 4GB in a one hour period, you must examine the link speed to determine if the RPO can be met. If you have a 10Mb link, under ideal conditions on a completely dedicated link with little overhead, 4GB takes about an hour to transfer. Meeting the RPO saturates a 10Mb WAN connection. The connection is saturated even under ideal conditions, with no overhead or limiting factors such as retransmits, shared traffic, or excessive bursts of data change rates. You can assume that only about 70% of a link is available for traffic replication. This means that on a 10Mb link you obtain a link speed of about 3GB per hour. On a 100Mb link you obtain a speed of about 30GB per hour. 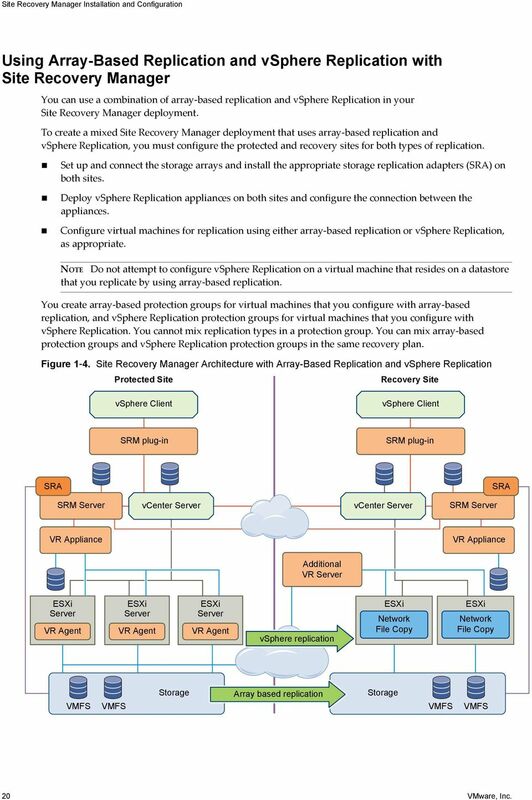 To calculate the bandwidth, see Calculate Bandwidth for vsphere Replication, on page 26. Calculate Bandwidth for vsphere Replication To determine the bandwidth that vsphere Replication requires to replicate virtual machines efficiently, you calculate the average data change rate within an RPO period divided by the link speed. If you have groups of virtual machines that have different RPO periods, you can determine the replication time for each group of virtual machines. For example, you might have four groups with RPO of 15 minutes, one hour, four hours, and 24 hours. Factor in all the different RPOs in the environment, the subset of virtual machines in your environment that is replicated, the change rate of the data within that subset, the amount of data changes within each configured RPO, and the link speeds in your network. Prerequisites Examine how data change rate, traffic rates, and the link speed meet the RPO. Then look at the aggregate of each group. Procedure 1 Identify the average data change rate within the RPO by calculating the average change rate over a longer period then dividing it by the RPO. 2 Calculate how much traffic this data change rate generates in each RPO period. 26 VMware, Inc.
Update 1 ESX 4.0 ESXi 4.0 vcenter Server 4.0 vsphere Client 4.0 This document supports the version of each product listed and supports all subsequent versions until the document is replaced by a new edition. VMware Data Recovery Administration Guide Data Recovery 1.1 This document supports the version of each product listed and supports all subsequent versions until the document is replaced by a new edition.